I love doing styled shoots. 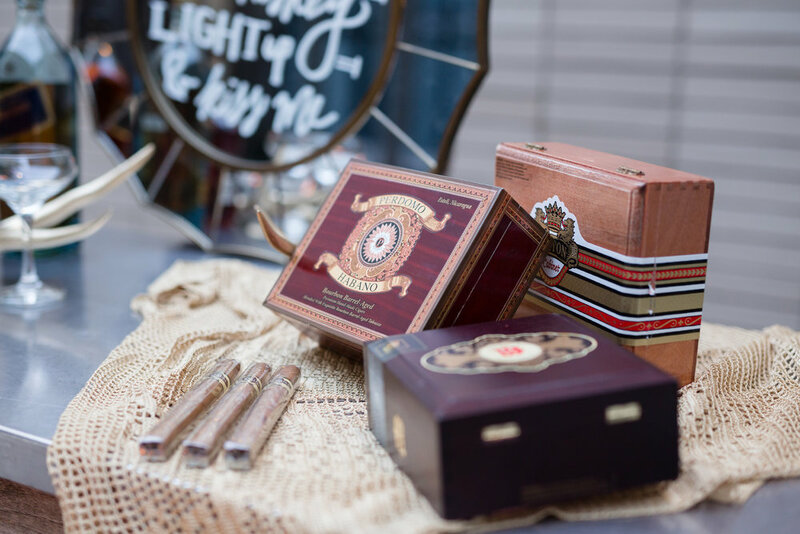 It is one of the best avenues not only to collaborate with amazing vendors, but to truly get creating and showcase all sorts of design and styling ideas that brides may not initially consider! Throughout the blog, I will be sharing some of our fabulous and oh so fun styled collaborations!! This week, I want to share a super unique shoot with you. 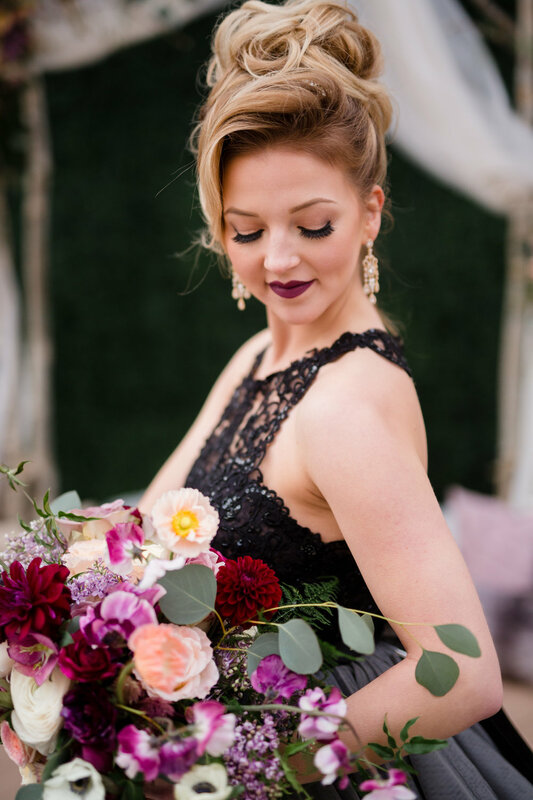 This shoot was centered around a new gown that The Bridal Collection had, and Master Stylist Jordan Ensminger was dying to showcase its unique style. 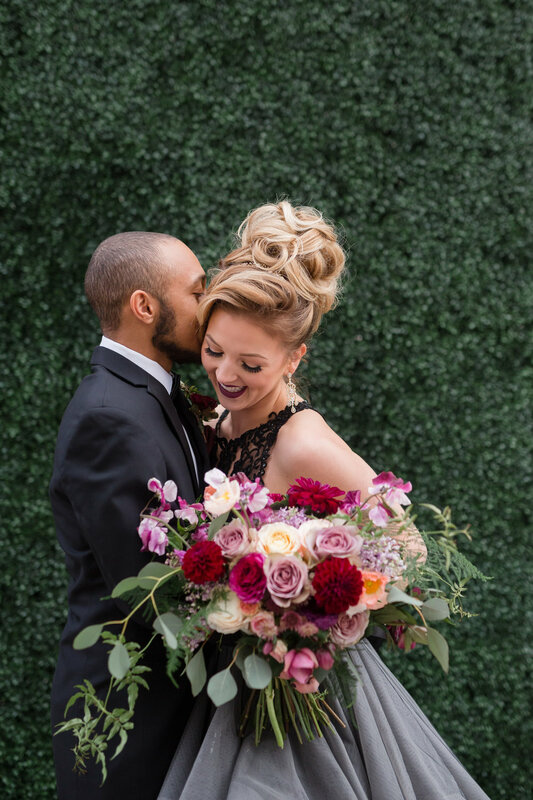 Jordan and I brainstormed a chic, moody and edgy style wedding, with rich colors and chic boho accents to compliment the unique black/grey colors of the wedding gown. 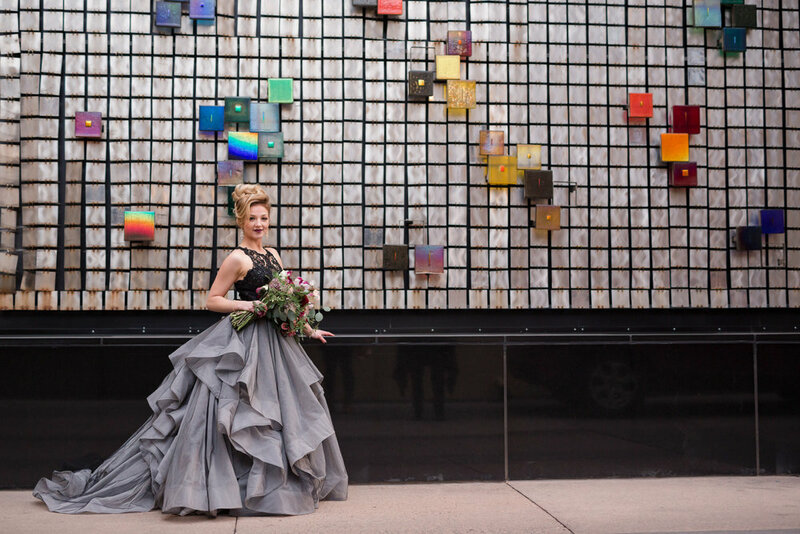 We were fortunate to secure the brand-spankin'-new wedding deck at the JW Marriott Cherry Creek, and their newly remodeled ballroom and outdoor courtyard for our backdrop. 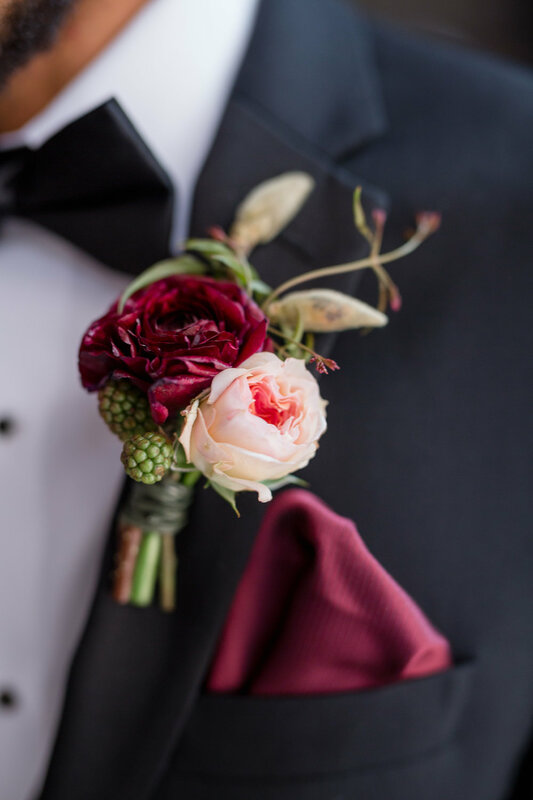 Erin Ashley Design pulled out all the stops on amazing florals throughout the shoot. 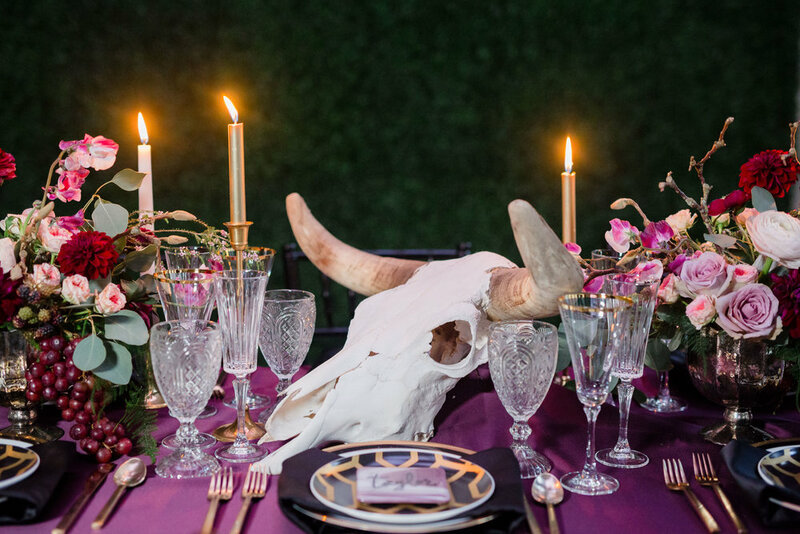 One of my favorite details is the real bull skull (thanks to one of my friends!) which we used as the focal point for the tablescape. 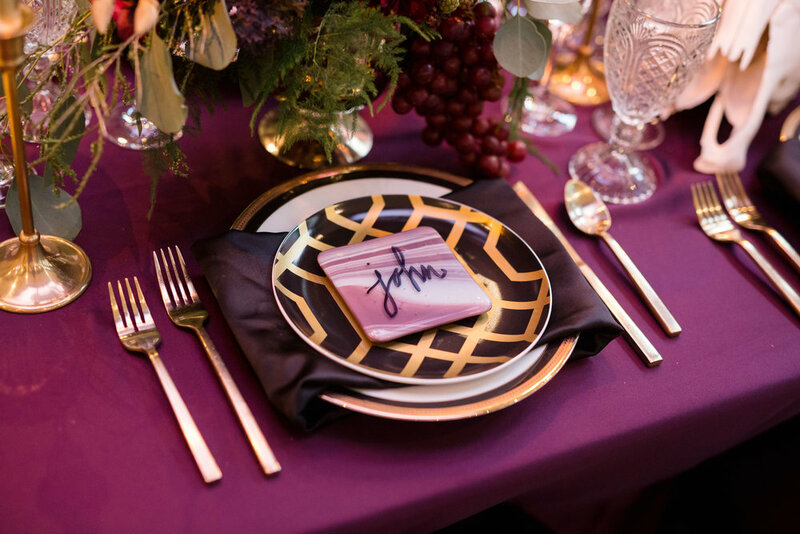 Paired with the rich plums and funky geometric dishes, and finished with gorgeous marble place-cards by Veronica Preston Design, this tablescape exuded a sense of drama and passion that we aimed for with the entire shoot. 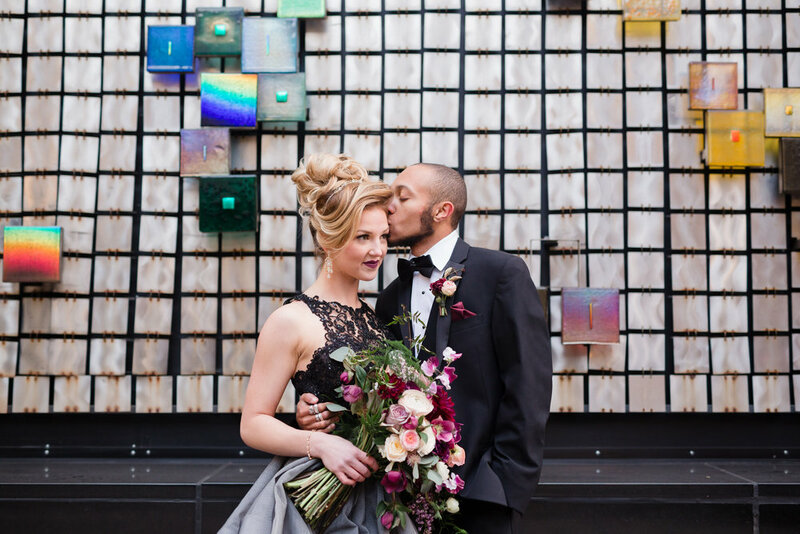 Our super talented photographer Sarah Roshan had a blast getting creating with shots around the JW, including a colorful wall along side the building, and an edgy montage in the valet complete with the bride in a leather jacket and their fancy getaway car. Other vignettes included a whiskey and cigar bar among the flames of the fire pits in the JW's courtyard, and a delicate sofa against an ornately decorated green wall. 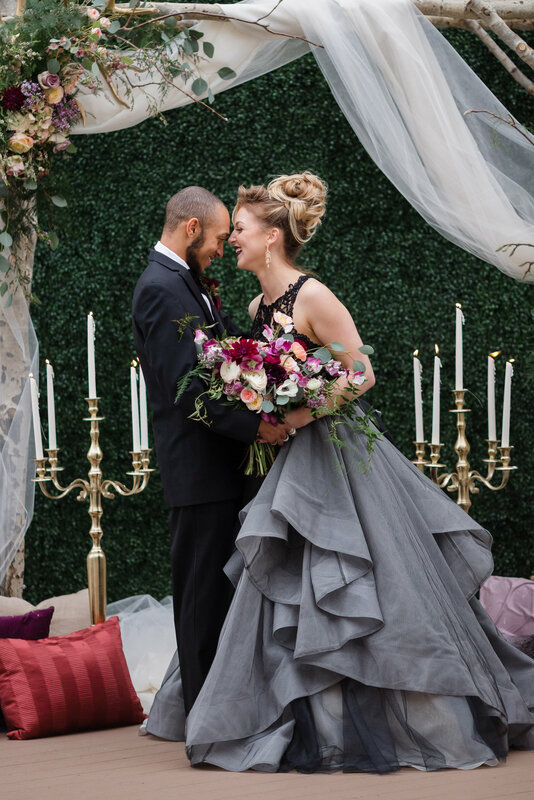 The invitation suite combined all the elements of soft, flowy fabric and deep, rich colors, and Cakeheads came in with a bang and a massive five tier wedding cake fit for the event!